They’re back! Low-rise jeans that is… This fashion fact has been greeted with enthusiasm by some and with more than hesitation by others. But there isn’t a need for so much apprehension because the current version of low-rise jeans are markedly different than their predecessors from the 2000s. The kind of low-rise jeans that pop icons Christina Aguilera, Destiny’s Child and Brtiney Spears wore were all about abs and fit, youthful bodies. The look was about exposed midriffs and tight, low-rider bootcut jeans that clung to the lowest possible point on the hip. Today’s version has an option that is looser in fit and more straight-leg. To all those who hesitated about the resurrection of this jean style, it seems fashion designers got the message. For instance, the 2017 collections by designers Alexander McQueen and Tommy Hilfiger showed low-rise jeans reminiscent of the 2000s. The runway looks were styled tight, low-rider with exposed, taut abs. The Spring 2019 collections from Linder and Chanel styled their looks in a more approachable way for the every-woman. These more recent versions have a looser silhouette than their 2017 runway counterparts. No doubt, influencers and celebrities have sparked interest in this type of jean. Bella Hadid and Kendall Jenner wear casual cropped tops with their low-rise jean outfits. However, Victoria Beckham shows how to style low-rise jeans if you want to be more covered up – not belly baring but a look that connotes a low-slung ease, a hip, casual vibe. Even if you wear your low-rise jeans a bit snug, a bodysuit or loose top are great styling choices. Yes, believe it or not there are advantages to low-rise jeans for certain body types. If you have a short torso they will elongate your torso especially when worn with a darker top. If you have a slim, boyish rectangle body shape with narrow hips, low-rise jeans that have a wide waistband will make your hips look wider and therefore curvier. And for every body type, if you worry about the jeans shortening your legs there are styling tricks for that. Just pick black or dark wash jeans and pair them with heels. To maximize the leg elongation, wear the jeans with flesh-tone heels or heels that are the same or a similar color as the denim. Of course there’s always the option of not participating in a trend. 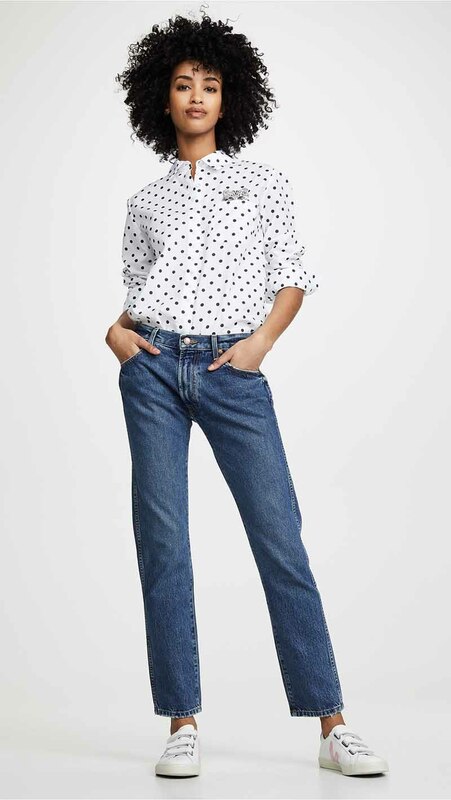 Maybe mid-rise jeans are the thing for you. You see, the return of low-rise jeans is not so intimidating after all!